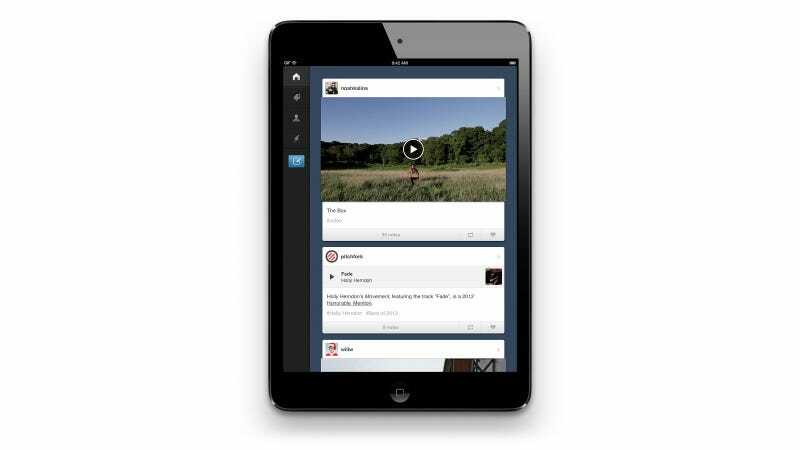 It's been a long time coming, but Tumblr has announced an update to its iOS app that finally makes it compatible with iPad and iPad mini. Built for the big screen, the app uses a sidebar for navigation—something you'll be used to from Facebook—and a new radial menu for selecting post types. There're other features, sure—quick re-blogging, neat pinch-to-zoom tricks, and general speediness thanks to being coded natively for iOS—but the real benefit is the fact that you no longer have to use a scaled-up version of the iPhone app.